Nice enough, fits in well with the Wards of Faerie cover and is a step above Brooks’ last several covers. No complaints here, though I’m not blown away, by any means. Be warned that the synopsis contains severe spoilers for The Wards of Faerie, the first book in the trilogy, which hasn’t been released yet. I’ll hide it after the jump, so not to tempt readers who don’t want to see it. The quest for the missing Elfstones – relics filled with powerful ancient magic – has gone badly awry. The Ard Rhys and her followers have been trapped inside the harsh mirror-world of the Forbidding, whose barriers are slowly eroding. Now they are at the mercy of all the creatures who were banished from her world because they were deemed too dangerous to live. This is the second novel in a breathtaking new series from the master of fantasy Terry Brooks. Returning to his core Shannara world, this spellbinding series will astound both seasoned Terry Brooks fans and those discovering his magical world for the first time. I loved Wards of Faerie (you’ll see just how much when my review hits in the next week or two) and I can’t wait to get my hands on Bloodfire Quest. 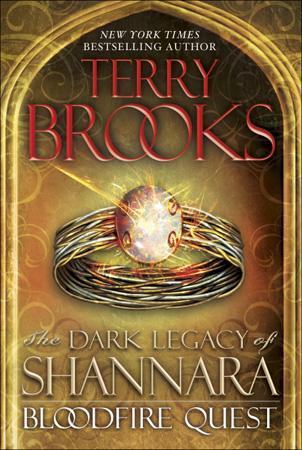 There’s a level of excitement in me for a Terry Brooks book that hasn’t been so strong in at least ten years.